Happy Mardi Gras! I made mini king cakes since I was giving them to all of my friends. 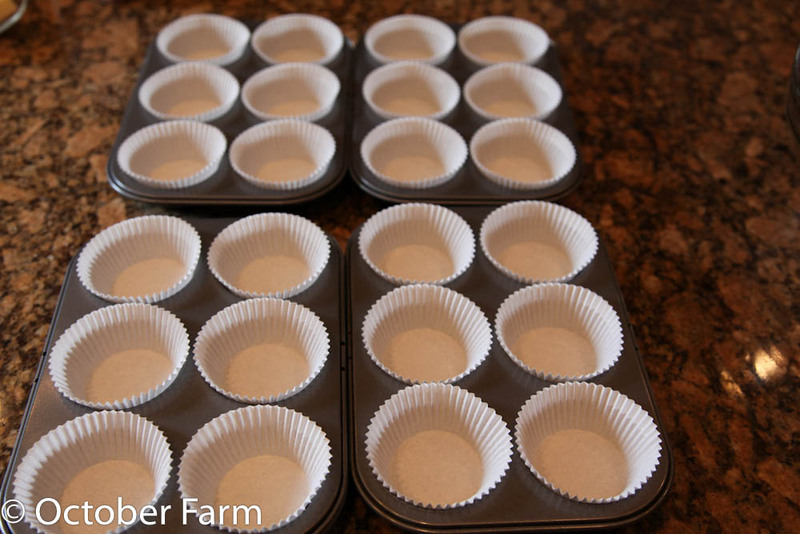 Depending on the size of your egg yolks, you might need to add more flour. 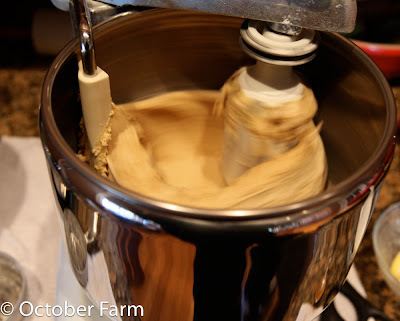 Keep adding it 1 tablespoon at a time until you have a smooth satiny dough that pulls away from the sides of the bowl. 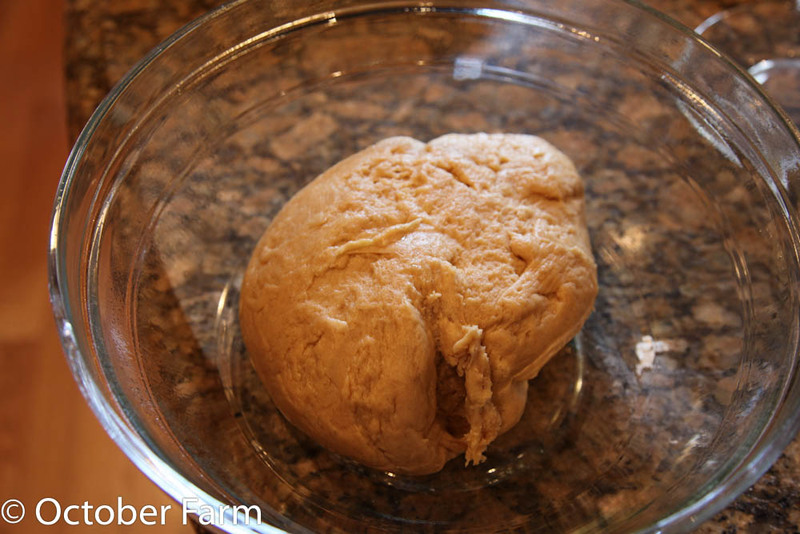 Place the dough in a buttered bowl turning it to coat. Cover the bowl with plastic and allow to rise for 1 to 2 hours. This dough does not rise a lot. Line 24 cupcake tins with cupcake liners. My recipe actually made 28. 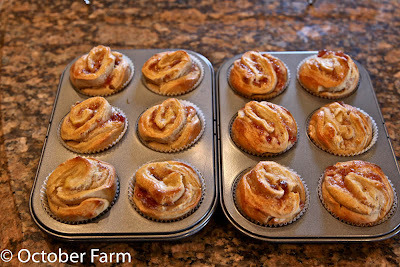 I got caught up in the recipe and missed a few steps and photos. 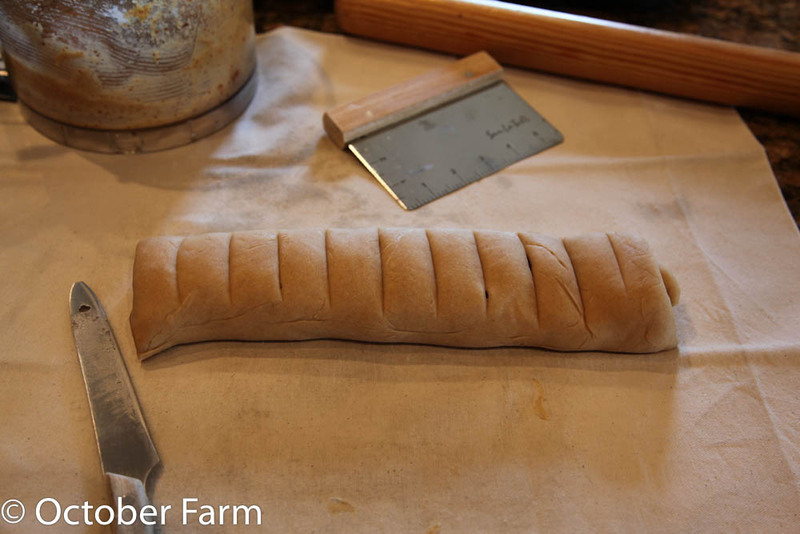 Roll half or your dough out into a 12 X 16 inch rectangle. Spread it with almond spread (you can buy this in cans in the baking section at your store). 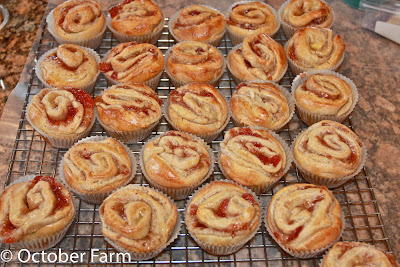 Then spread a layer of the jam of your choice on top of the almond spread. Roll the dough jelly roll style and finish seem side down. Gently stretch the roll to even it out. Score the roll and slice it in just over 1 inch slices. 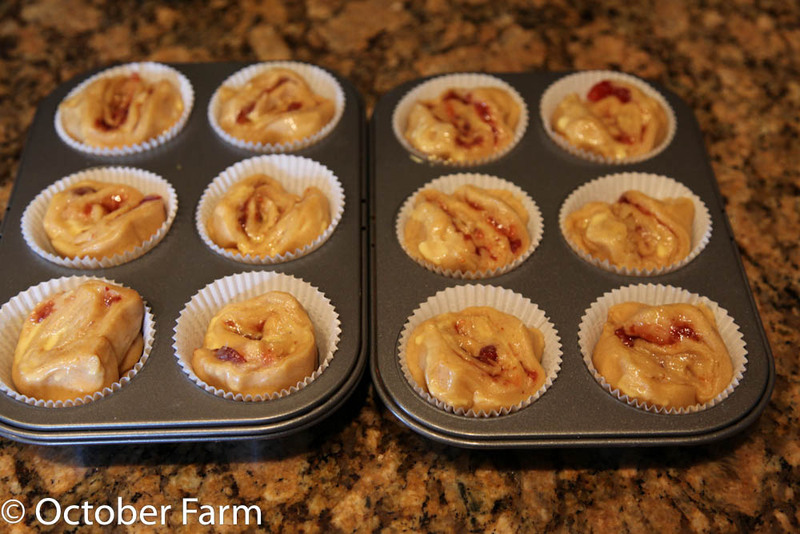 Round each slice out and place them in the cupcake liners. Beat one egg with a bit of cream and brush each cake. Preheat your oven to 375 degrees and bake them for about 25 minutes. Allow them to cool on a rack. 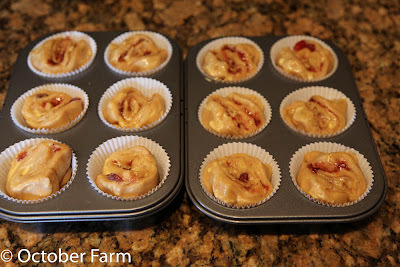 While they are cooling mix 2 cups of powdered sugar with a few tablespoons of milk. The icing consistency should be just thin enough to drizzle over the cakes. Sprinkle the cakes with purple, yellow and green decorating sugars. 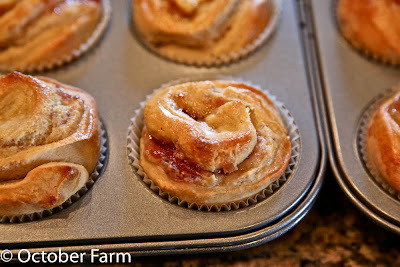 This recipe is good for anytime and can be frosted with just the icing or any color of sugars you like. Is there a baby in each one, LOL? Sorry about not commenting Yesterday! I had gone to bed by the time You posted Your blog and it refused to open up when I tried this morning. I´ve eaten this cake once or twice, but I just can´t remember what it´+s called here. 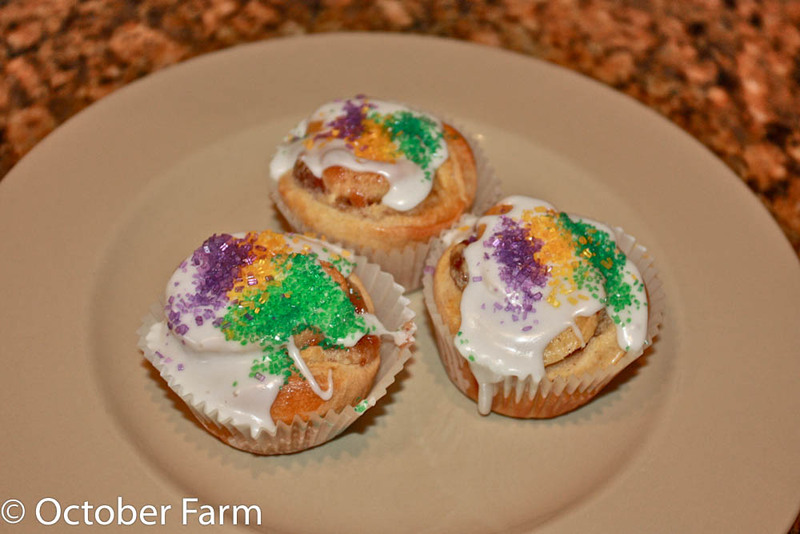 These are the sweetest King Cakes I have ever seen. We should have been on Bourbon Street selling these little goodies today. 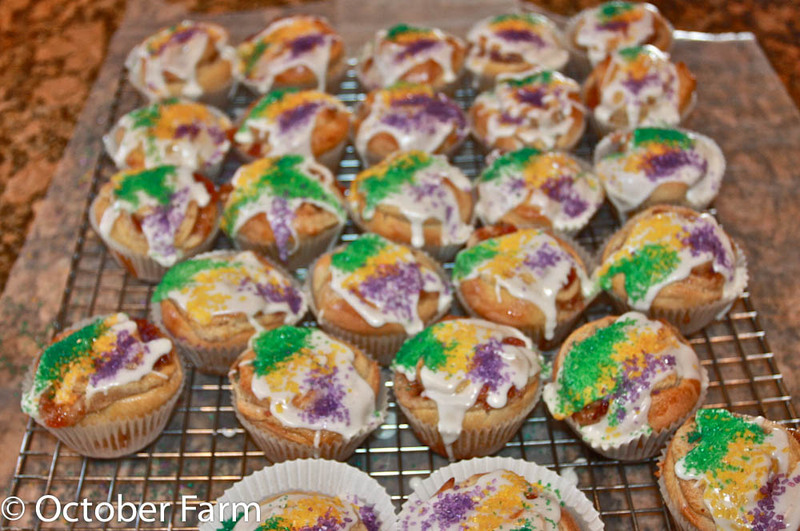 Did you know over 750,000 King Cakes are sold in New Orleans during Mardi Gras each year. 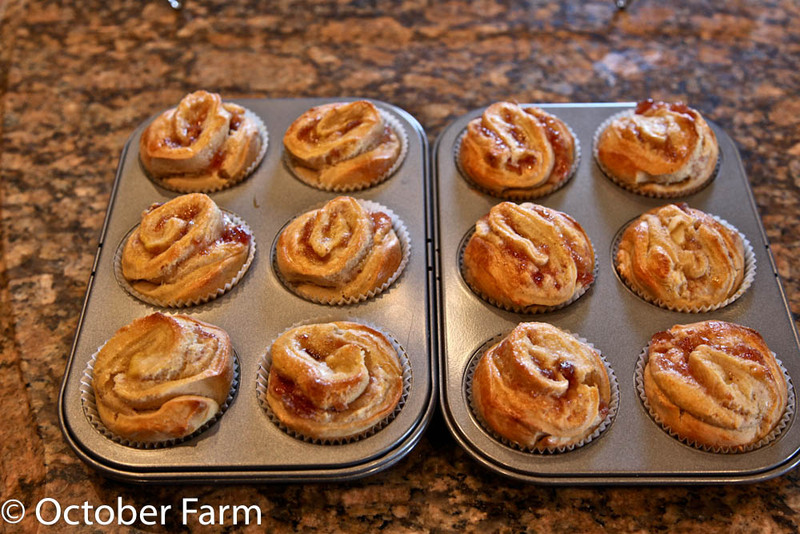 Your friends are fortunate to be gifted with these : never thought to divide the recipe for individual minis. I love the way the coloured sugars decorating the top of the cake mirror the color scheme of Mardi Gras : gold (yellow) for power, green for faith, and purple for justice. Who got the baby king in cake. 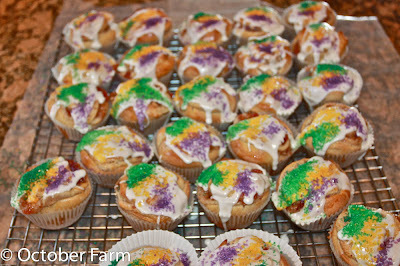 They are the ones who will be funding the next mari gras cakes...yum yum and fun to eat. I had pancakes today, as it is Shrove Tuesday. But this looks delicious. Those are just perfect! I am grabbing your recipe for next year! Awesome! Your friends are lucky, they look delicious and so festive and colorful too! They look so yummy and festive! Happy Mardi Gras! Yum! So festive too! Happy Fat Tuesday! Happy Mardi Gras! Those mini King Cakes are adorable!!! These look SO good!! Why is it, every day,after reading your recipes, do I automatically jump up and run into my kitchen, only to be met with disappointment that no treats are waiting for me? Pavlovian response?